Gosh, what a difference 4 months and a lil love makes! And to think that I wasn’t sure if I could fill the entire space…sheesh. I’ve learned many a lesson thus far and I still have a good part of the growing season left. Birds love peas. Birds eat peas no matter how big or small. Peas get annoyingly netted for life. Weeding for 5-10 minutes per night is better than taking up half your Saturday to do it. Weekly visits to the farmer’s market are only necessary for fruit now. Yay!!! You actually need to water your compost pile too. 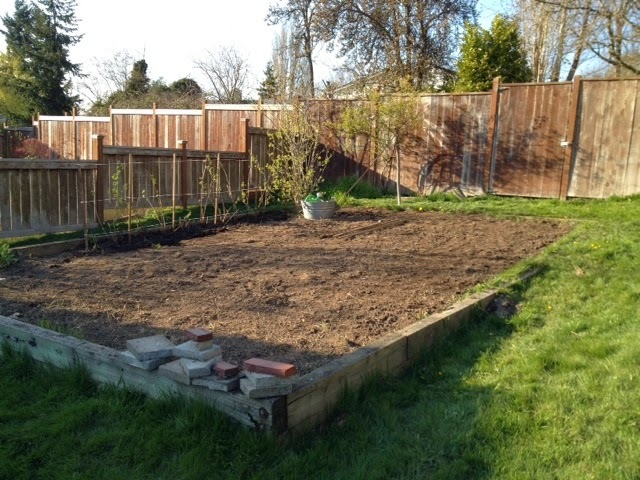 I’m hoping to get both a pear and apple tree planted this fall along the fence line. I dearly miss having fresh apples like we did back in the day. Nothing was better than those tart apples from the yard! And once those trees get a bit bigger, they will give us a bit of extra privacy from the neighbors. I’d also like to try my hand at a winter garden but this year isn’t the year my friends. With a wedding quickly looming, I know I’m just not going to have the bandwidth for that. BUT, I’ve been reading up on it and will be fully educated and ready to go come the summer of 2015. 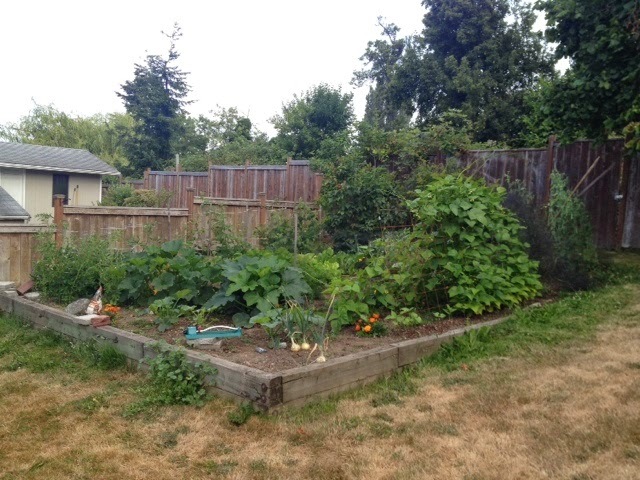 How’s your summer gardening coming along?? You guys, my mind is seriously blown. I can walk outside to my garden, pick a few things then have dinner side dishes and dessert going just minutes later. I know that’s how a garden should work, but this newcomer is totally in awe these days! I suspect the fiance is sick of me yelling to come outside and take a look at how big (fill in the blank…with veggies you dirty minded people) got! I sauteed these snap peas and carrots in a lil butter and made fritters with the zucchini, which is growing a mile a minute. I swear, each time I’m out in the yard, there’s another huge one waiting for me. I’m starting to give them away because I just can’t eat that much zucchini. I’m all too happy to share! We also have a bunch of blackberry bushes behind our house in an overgrown alley and they are already plumping up. Since no one can access them but us, I know they haven’t been sprayed with chemicals and have been eyeballin’ them all summer. Jams, pies and blackberry mojitos fill my dreams – yum. I quickly picked about two cups the other night to make this slab pie thing to get my fill though I did cheat and use store bought pie dough (organic of course so that counts right?) A girl has her weeknight limits, you know? A friend and I are picking this weekend and plan on making some wicked jam. Can’t wait! My harvest from the other night. So freakin’ awesome! 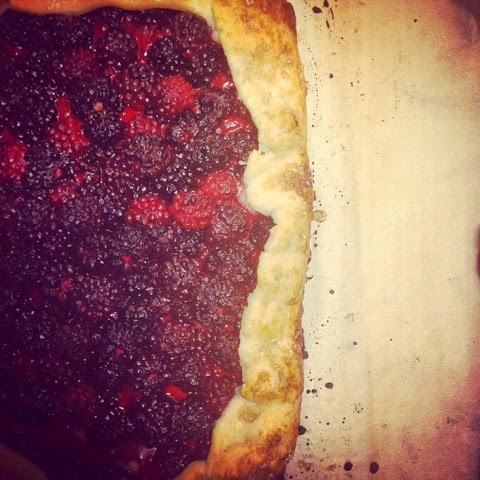 I rounded up just enough blackberries for this rough lookin’ pie thang. 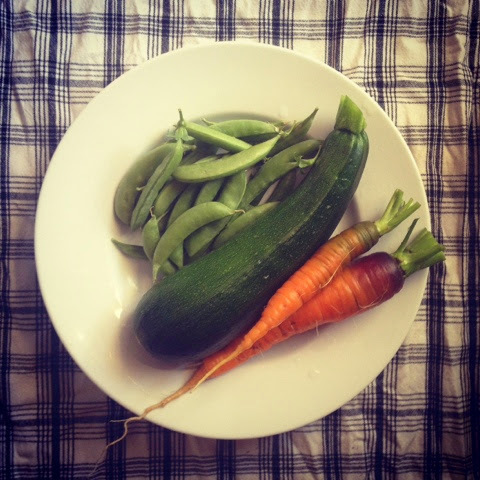 The garden is picking up a bit-o-ste am around here. 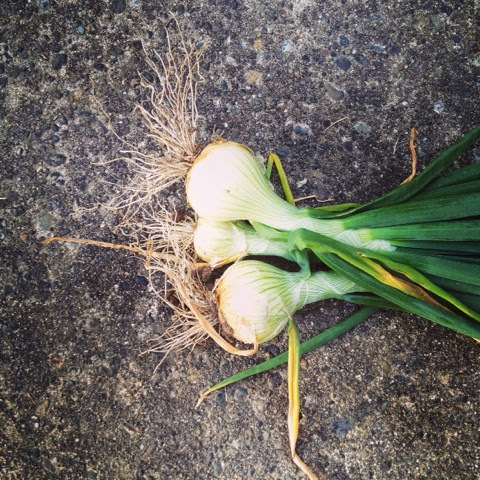 Harvested (which sounds so funny to me…) enough greenery for a salad plus some onions to grill up alongside our steaks. Not bad, if I do say so myself. 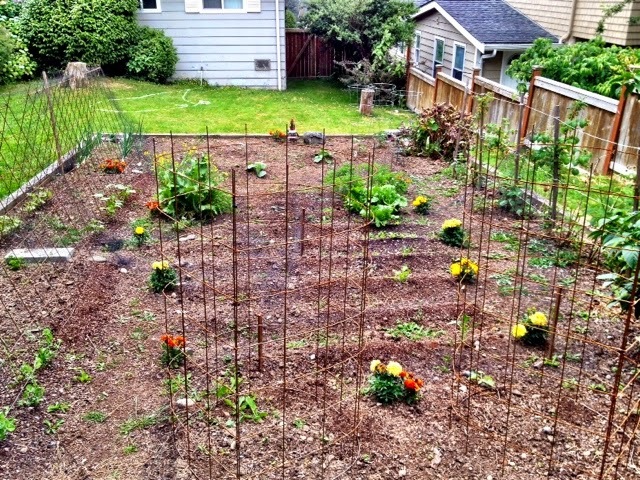 My garden in her caged, netted glory! 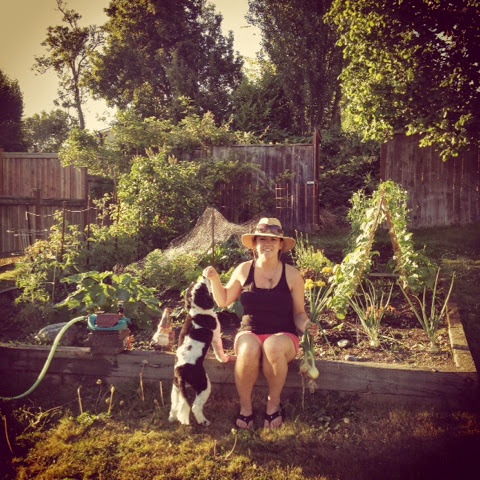 Just thought I would share a gardening update with you, since I’m sure you’ve been at the edge of your seating waiting for this 🙂 Gardening is kind of my new addiction these days. I often times come home from a long day at work and just somehow end up in the yard weeding and watering until the sun goes down. I go back into the house almost refreshed. Weird, I know. Oh my poor peas! The one thing that is usually a no brainer when it comes to gardening. Sheesh. My peas struggled from the start. First it was these little green bugs (probably aphids) then it was the birds. Every afternoon I’d walk out there to find these angled cuts out of the leaves. Not slug holes, but these really sharp cuts. After enough Google searching, I realized that the birds were gobbling up my tender pea shoots. F-ing birds. I netted the plants and they are bouncing back. I still have two more plantings to go so I suspect we’ll end up with an OK harvest. 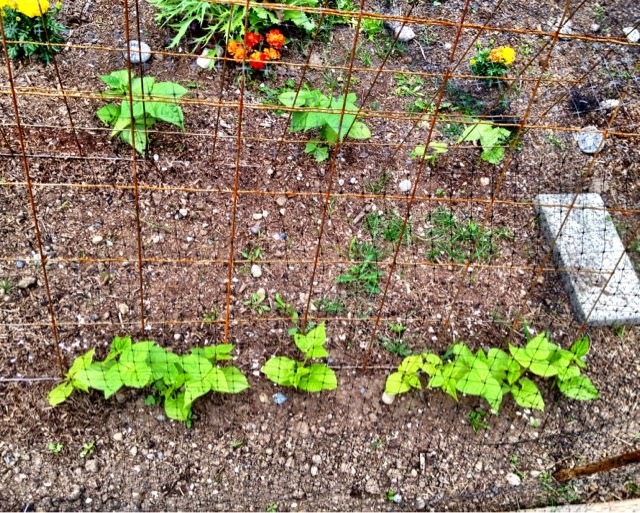 Also attacked by birds, my beans are now doing well with the addition of netting. I’ve got the Blue Lake variety on one side and let’s just call them the Magic variety on the other. My Dad gave me the latter from a friend of his and boy they are amazing! They popped up out of the ground in no time and are growing like weeds. I have high hopes for the Magic beans and will most likely try and save some seeds for next year. Regular beans at the top of the photo, magic beans on the bottom. 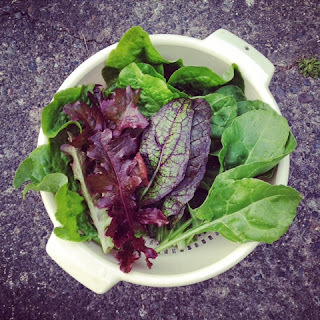 My lettuce is thriving (also a bird favorite and now netted) and I’ve harvested a few heads of Butter Lettuce so far. Kale, also a crop I heard is uber easy to grow did not fair well in the first and second plantings but I think I’ve got it the third time around. Spinach is starting to pop up too! 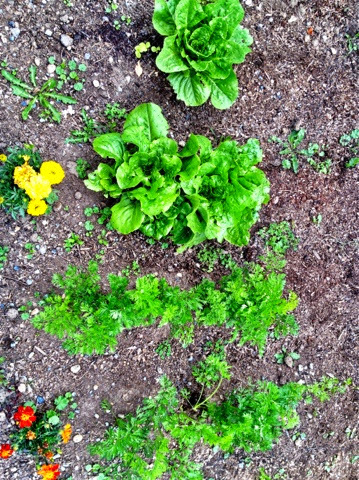 I’ve got a few more plantings on the books so should have plenty of greenery for the summer salad season. Not sure what I was thinking planting these, but I’ll give ’em a go for a bit and see what happens. They also got gnawed on by the birds so also fall under the netting now. I’ve had zero luck with eggplant so far – very much considering giving up on that and replacing them with something else. Zucchini are finally starting to grow a bit. Delicata and acorn squash are hanging in there too. I’m also trying to grow some starts (for like the 5th time!) since my seeds haven’t really taken off in the garden. I made these cool circular cages for some of them so I hope to see plants winding their way up them soon! Just put 6 different varieties in the ground last weekend. I should have probably stuck with 2 or 3 but it’s so hard to resist ’em! Half are planted near the patio and the other in the garden. I’ll be curious to see which grows better. 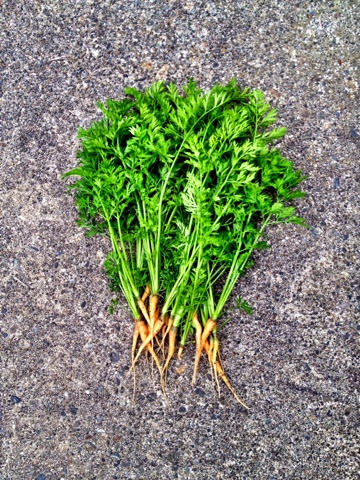 My first round of carrot planting went well and the stems are like 7 inches tall! I did not realize you needed to thin them until a work colleague pointed that out to me. I spent last night aborting half my lovely carrots. Guys, I felt horrible doing this! Luckily, my second and third plantings are tiny so I thinned them out too and didn’t feel as bad since they hardly looked like a carrot. Lesson learned. My mom gave me all of my starts this year and so far, so good! I lost a few but the rest are taking off. I suspect we’ll have a small, small harvest this year but I do plan on adding more plants down the road. Who wants to pay $5 a pint for them when you can just grow them in your backyard?! We also have a crazy amount of blackberry bushes in the back that have never been sprayed so we won’t be short on berries this summer. Well that’s about it from my yard. How’s your gardening going so far? 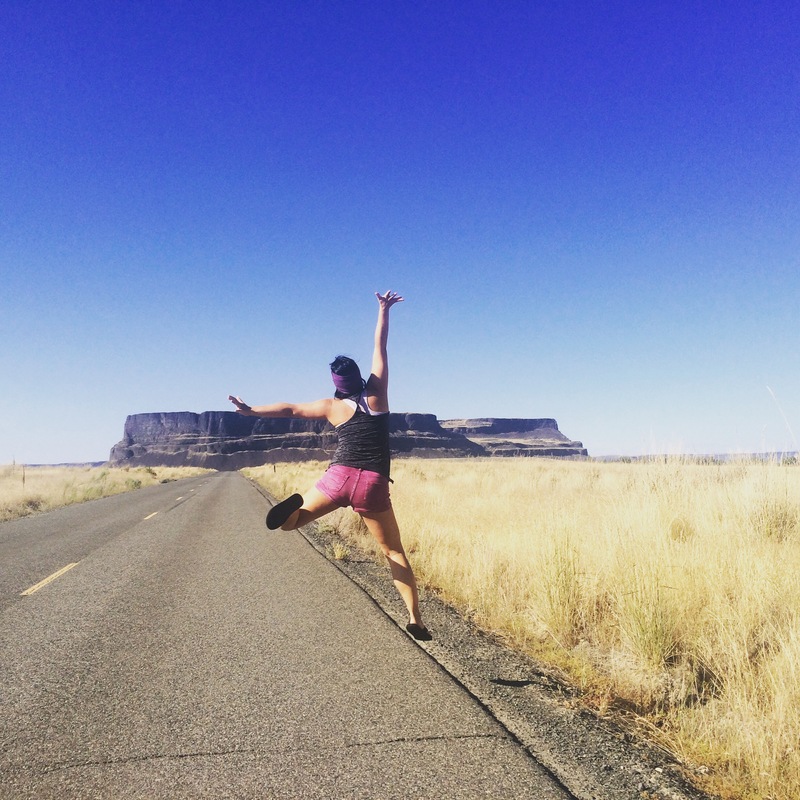 What are your biggest lessons learned? Do tell!